Nickel-plated lead shot is different from your typical lead shot in that the coating allows the shot to leave your barrel a bit smoother, gives more penetration, and can lead to easier kills when hunting pheasants and waterfowl. While this shot is more expensive than your average lead, there are definitely some benefits that make it worth the price. The main issue is the hardness of the lead inside. A good manufacturer will use a good quality lead shot and coat it with nickel. Others use a softer lead – which loses predictability, but can still have some advantages, such as less risk of lead contamination. #5 nickel shot is a great choice for birds of all sizes, but is marketed mainly as a pheasant shot (and is effective for turkey and ducks due to the range and number/size of the pellets). These mid- to large-sized birds are very fast, so any advantage can help you have a more successful hunt. Most commonly found in 12 gauge, nickel-plated shot is also available in other common shotgun gauges. This nickel-plated ammo gives shooters a slight edge in velocity and penetration, and that can make quite a bit of difference in what you bring back from any successful hunting trip. #5 is widely allowed, but be sure to check the local hunting regulations on shot size. Coyotes, rabbits, foxes – and anything that can potentially cost you money or time on your property – can be a significant problem. If you are financially reliant on crops or livestock, you will eventually run into trespassing critters. Trying to hit a rabbit with 00 buck or a .22 LR takes a higher degree of skill, whereas bird shot covers a wider area, greatly increasing your likelihood of hitting the target. This saves ammo and you’re more likely to get an immediate kill instead of simply scaring something away to return when you’re not home. Nickle plating furthers the advantage of the smaller shot size in that it gives a more consistent pattern, allowing for a more predictable shot. The #5 fired from a shotgun is recommended for shooting clays in your backyard or stationary targets, due to its great balance of spread, range and power. Nickel-plated shot will cost more than lead shot due to the cost of materials and the extra time needed for manufacturing. If it's for occasional use, you won’t notice it. But if you target shoot as a hobby, you're likely to notice the cost difference. It comes down to your preference for or against solid lead, and how the ammo performs with your specific gun. 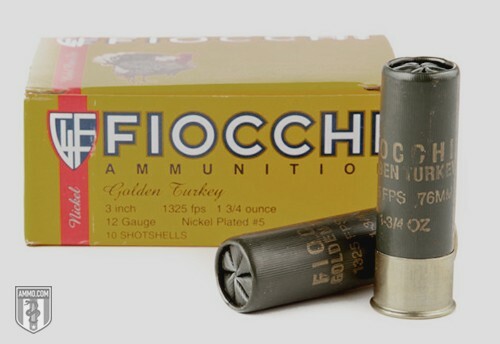 Several manufacturers make shotshells using nickel-plated shot – with Fiocchi and Hornady being the largest. #5 nickel-plated lead shot isn't a first choice for home-defense purposes. But if you were to shoot an intruder with this bird shot, it will cause a lot of damage – especially at the 10- to 15-foot range found inside most of our homes.